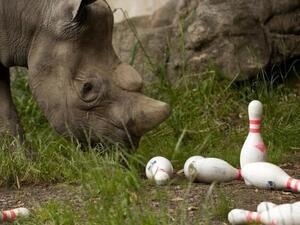 Strike out extinction at the 28th Annual Bowling for Rhinos. Join the Portland chapter of the American Association of Zoo Keepers and the Oregon Zoo as they go Bowling for Rhinos on August 11. The fundraising event has raised more than $7 million since 1990, giving 100% of its proceeds to help the animals who are under threat. The Portland Chapter of the AAZK has raised $330,523 of that total to help rhinos survive. Bowlers raise funds by gathering tax-deductible pledges from friends, family and anyone who wants to keep rhinos from extinction. While bowlers are not required to collect pledges to participate, every dollar makes a difference for rhinos. The Portland event features door prizes and raffles for a variety of items, and five free raffle tickets are awarded for every $100 collected in pledges. The bowler who raises the most in donations will receive a "behind the scenes" at the Oregon Zoo and will be entered to win a trip to Africa or Indonesia. Bowling for Rhinos funds help protect 25 percent of the black rhino population in Kenya, 60 percent of the Sumatran rhino population and all of the Javan rhino population. Funds will go to support the Lewa Wildlife Conservancy, Ujung Kulon National Park, Bukit Barisan Selatan National Park and Way Kambas National Park. Located in Kenya, India and Indonesia, these parks protect the five extant species of rhinoceros — black, white, Indian, Javan and Sumatran — while providing habitat for hundreds of other endangered plant and animal species. Bowling for Rhinos will help an estimated 50,000 people directly benefit from Lewa's development programs in education, health, water management, infrastructure and more. Click here to register, donate or find more information or email us at portlandbfr@gmail.com. $20 for adults, $10 for kids (includes shoes).